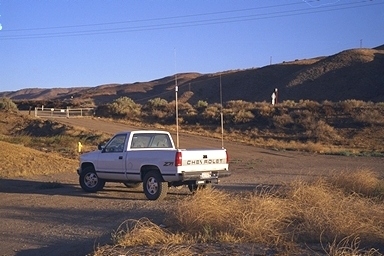 IN THE FIELD - Two HF1-x Mounts, one with a 20m Hustler antenna and one with a Hustler 2m Colinear antenna. 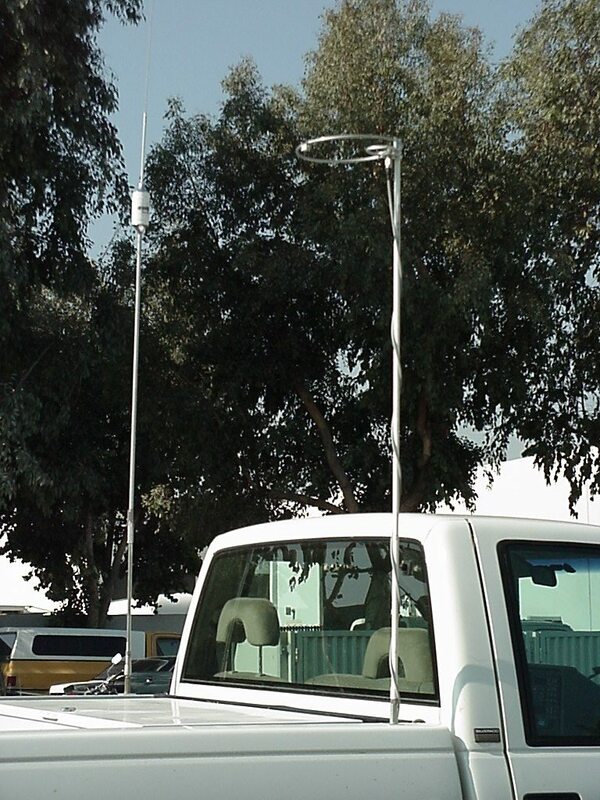 MODEL HF1-x - Another view of the same truck and mounts from a distance showing the clean installation achievable with the GeoTool Pickup Truck Antenna Mount. MODEL HF1-x - Close up showing the HF1-x mount with a Hustler quick disconnect adaptor. This adaptor can be used with any antenna with a 3/8"-24 thread. MODEL HFI-1 The latest addition to our line. This insulator is designed for use with any antenna coupler such as the SG-237. The black Delrin insulator, stainless mounting hardware, and a solderless connector are included as shown in the photograph. Connecting wires and antenna are not included. This mount has stainless steel thread reducing inserts inside to securely anchor the delrin mount using a 3/8"-24 bolt. Top mounting hardware is also 3/8"-24. The insulator is now available in White. 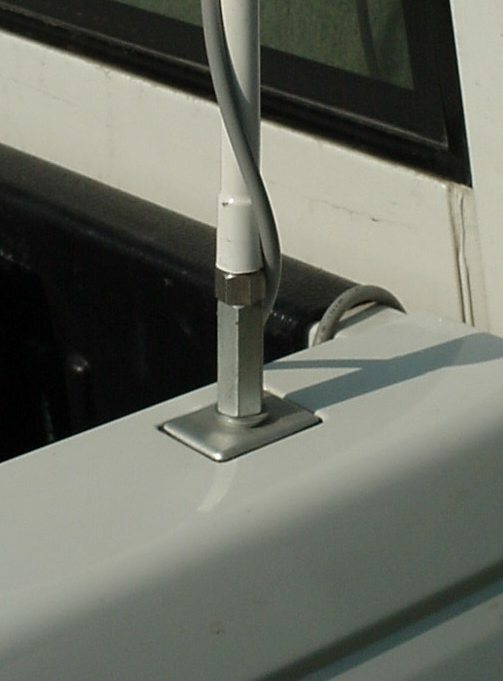 MODEL VHF-1 - Large and small antennas work well with the SO-239 adaptor on the Model VHF1-x antenna mount. Here a 2m quarter-wave whip is in service. Short antennas like the quarter-wave are excellent for local repeater use. They often outperform higher gain antennas which have a much lower angle of radiation. 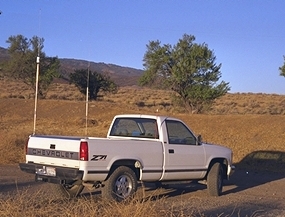 Photo of the VHF-1 in Ross's truck. He is using a shortened mast and a 3 band Hustler resonator adaptor. Our antenna mount works well with any antenna with a 3/8"-24 mounting thread, including Outbacker (ask for the modification to install a ground screws on the top of the mount), Hamstick, firestick, and CB whip antennas. One of our distributors is also a user. 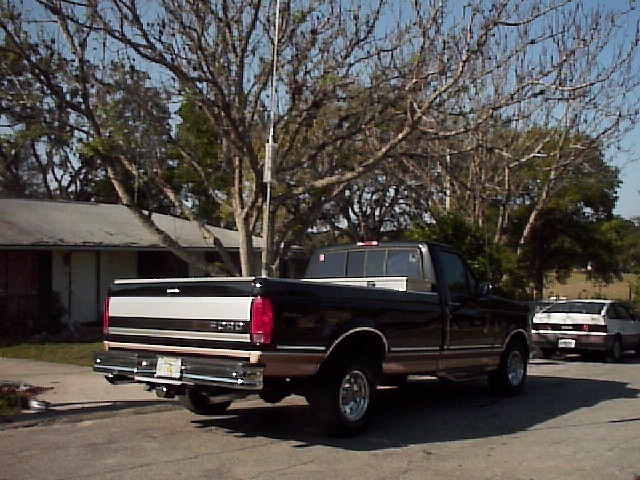 Here's a picture of Sam's truck with a HF1-x mount and 40m Hustler antenna. 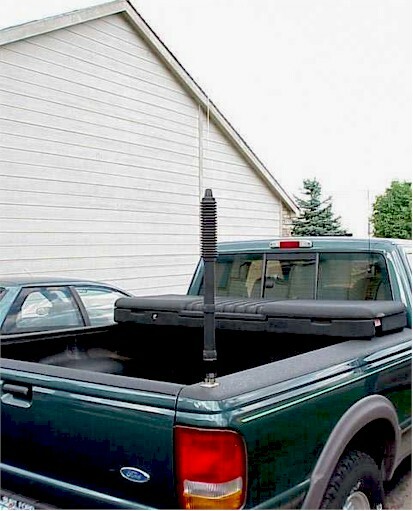 The monstrous Texas Bug Catcher on a Ford F-150. 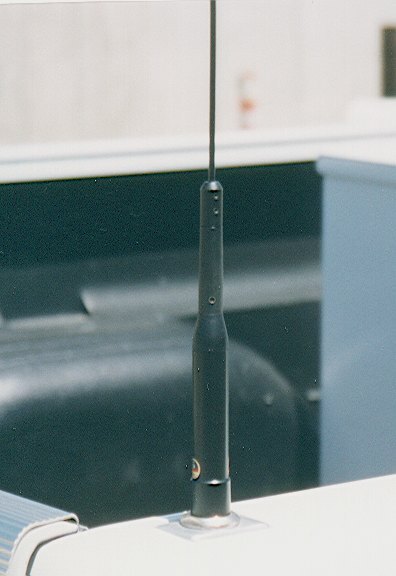 The antenna and mount are reportedly still going strong after about a uni A unique stake pocket shim was used here, and is shown in the photo below. RTV compound was installed between the top of the stake pocket and the mount. 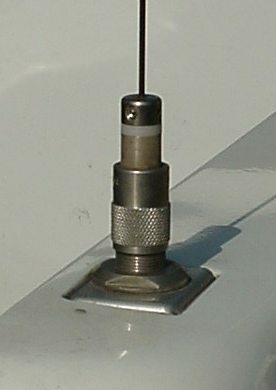 Another view of the Texas Bug Catcher showing the Model HF-1 mount with grounding taps, as well as the large impedance matching coil at the base of the antenna. Note the black RTV shim around the top of the mount. A perfect match for the VHF1-x. 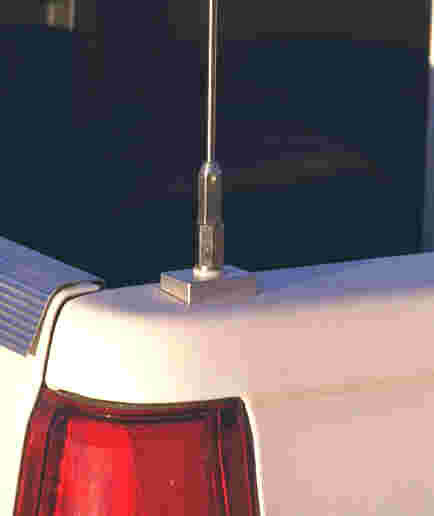 This antenna uses the S0-239 version of the GeoTool Mount. Most bands can be easily loaded to near 1.1:1 resonance. Reportedly, some bands may require manual tuning to get them close, but then the memory in the Yaesu antenna system will return to the correct setting the next time the band is selected. A great application of the grounded stud mount. 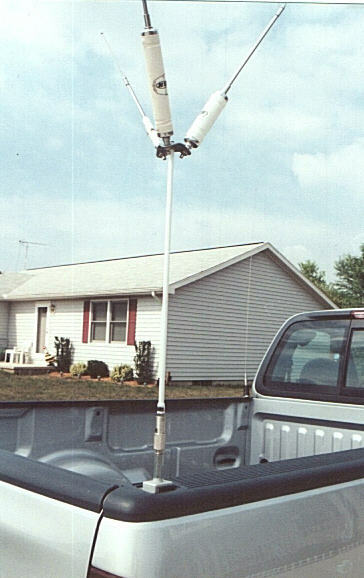 Here a Hustler mast is with a KB6KQ loop antenna attached. 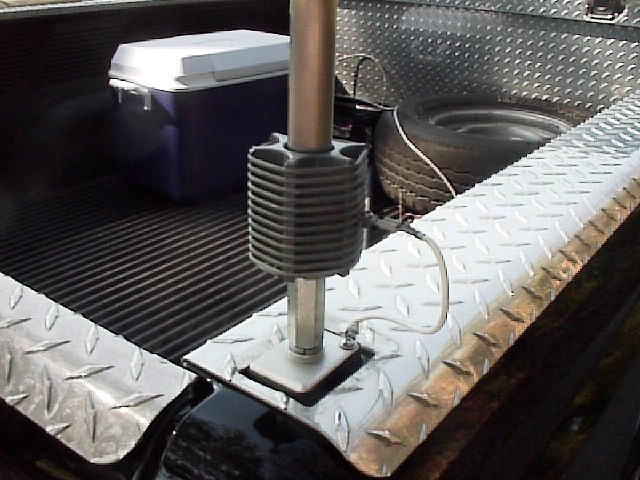 The mount mast is grounded to the truck through the anchor bolt, providing a perfect installation for the antenna. A close up of the base of the SM-1 Grounded Stud Mount. The mount has all the features of the HF-1 and HF-2 mounts, with the exception that the coupling bolt is grounded to the body of the mount. 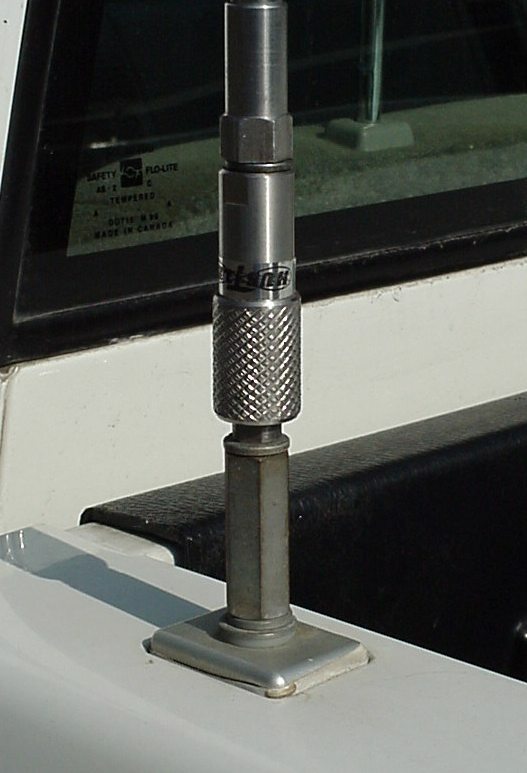 It can be used with the coupling nut shown here, or without it to mount to a screwdriver antenna. (Not used with the ATAS-100 which requires the SO-239 mount. The antenna mount design so unique it was awarded a patent!